We all have one – the panel that sits outside of your home, or inside your garage or basement, and is covered with many switches. Many home owners are not familiar with these panels, or simply intimidated by them, since they’re an electrical panel. It’s understandable, especially with how dangerous electricity is and can be; more so if you’re unfamiliar with electricity. But much of that worry can be softened. 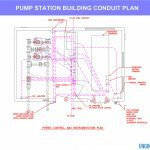 To make you more comfortable with your electrical panel, we will go over the details of this panel in order to better help familiarize you with it. And from here on out, we will call this panel your “service panel”, as it serves everything that is electrical in your home. The loads it serves includes lights, appliances, and anything else that you plug into your home receptacles. Our general overview will help add another notch to your handyman tool belt, which is always a good thing. From your local utility service, power is provided to your home by first going through your electric meter. The electric meter tracks how much power you use; then once the power used is calculated over a month’s time, you will receive your monthly electric bill. Now, from the local utility, after going through the electric meter, power is served to your home through your service panel. Then from your service panel, electricity is distributed throughout your house through individual circuits. These circuits are the receptacles, also known as outlets, that are spread throughout your home. One circuit may be only one outlet, called a dedicated circuit, and another circuit may be made from three receptacles. So, think of your service panel as your central station for your home’s power source, where everything electric is directly controlled. We have shown below the inside of a service panel, which shows the wiring and circuit breakers inside. There’s a lot going on, but don’t be overwhelmed. 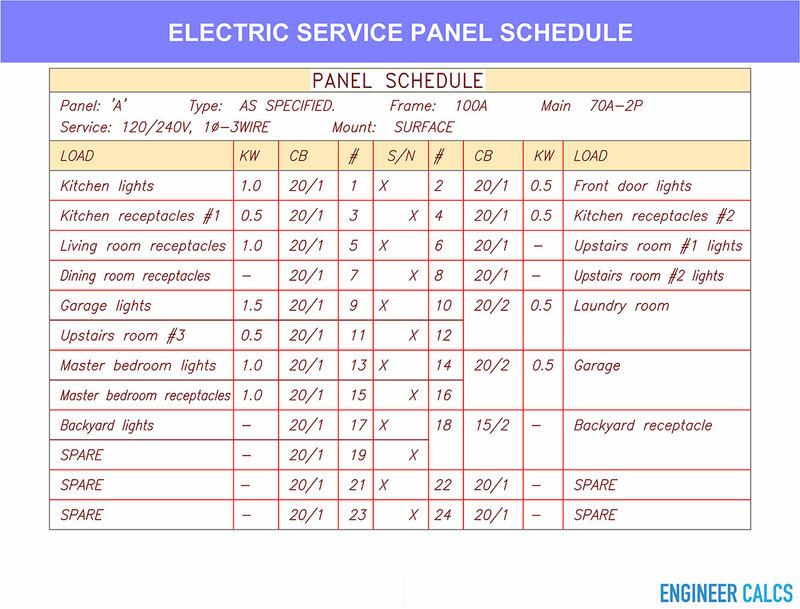 We will go over what you need to exactly know when dealing with your service panel. The circuits, referenced above, each have their own individual circuit breaker or fuse. A service panel – most of the time – either has all circuit breakers or all fuses inside. We will call “circuit breakers” and “fuses” protective devices, as they are in your service panel to protect your circuits. Now, these circuit protecting devices each have their own individual ratings; imagine a 20-amp circuit breaker. 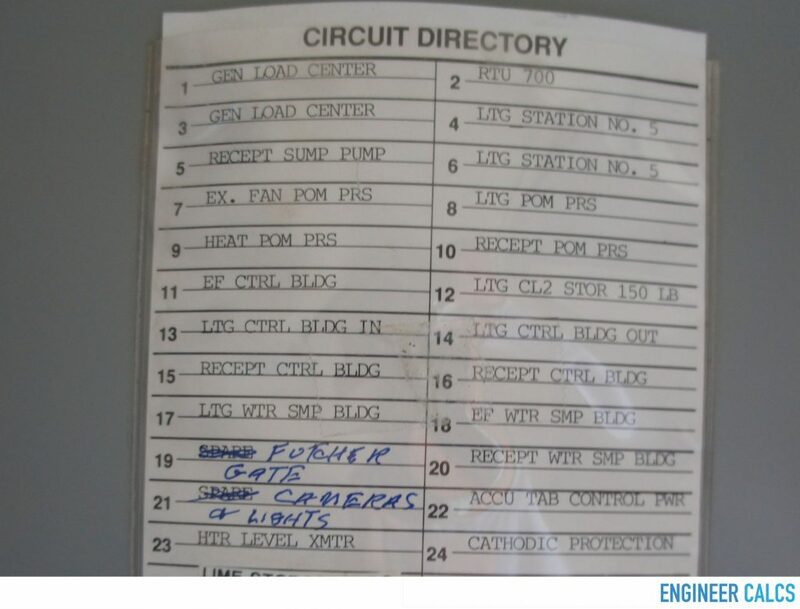 So, if circuit #1 has a 20-amp circuit breaker protecting it, then no more than a 20-amp load can be connected to this circuit; otherwise the circuit breaker will trip, which we will discuss in greater detail later. 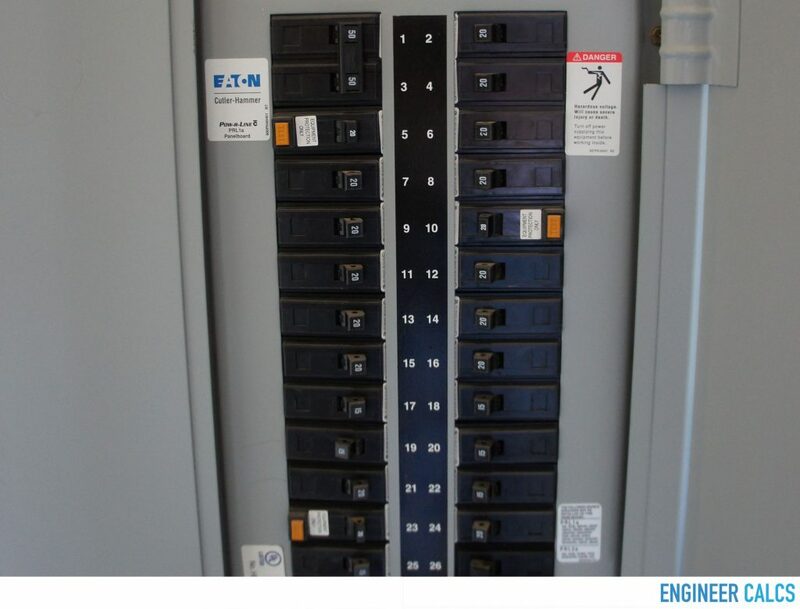 Pictured below are the circuit breakers that feed loads in a home. Moreover, we’re going to see where these individual ratings for these protective devices come from. Thus, first, we need to first understand that the local utility supplies only a given amount of power to every home. From this total power provided by the utility to each home, the service panel circuits are accordingly sized, and then divided and distributed throughout your home in order to meet the power needs of your home. If you add all of your protective device ratings together from the inside of your service panel, the sum will be less than or equal to the total amount of power your home is provided by your local utility. Why do circuit breakers trip and fuses blow? Now that we better understand the service panel, let us go over why and how these protective devices are triggered. 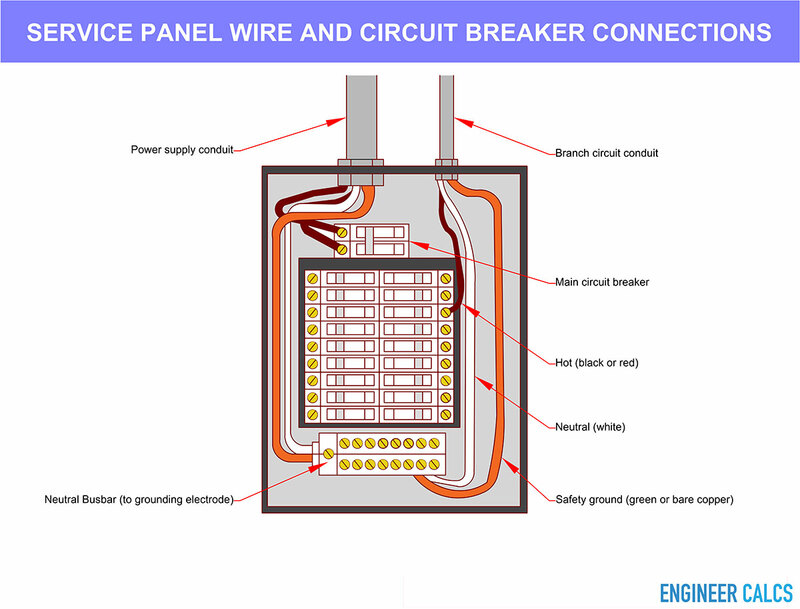 In the case of a circuit breaker, it trips, meaning the circuit breaker goes from a state of being closed to open; and with a fuse, it blows when triggered, quite literally the connecting mechanism between the power source and circuit safely “blows up” or burns out. 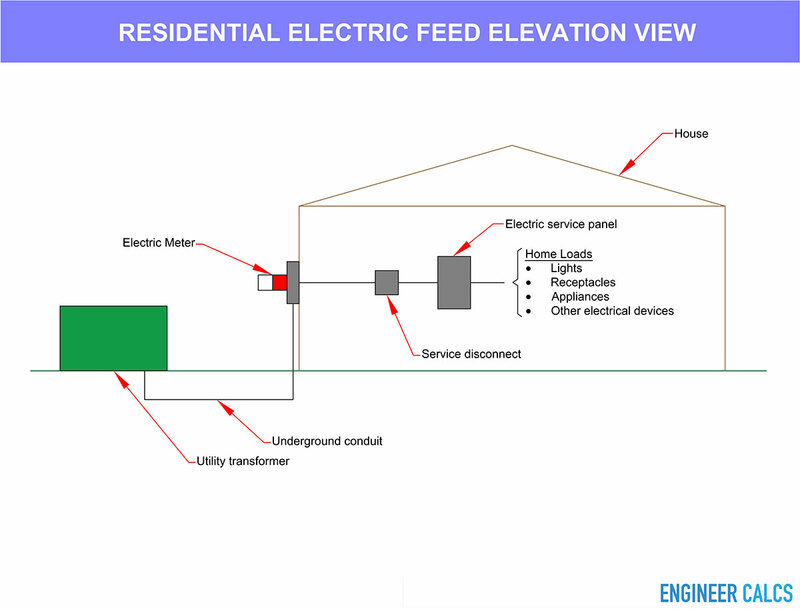 In both cases, the circuit in question becomes disconnected from the power source, which we learned from the above elevation view picture, is in reference to the power coming from the utility transformer. When a circuit has a connected load that requires more power than the circuit can provide, the protective device will be triggered. In the case of a circuit breaker, it will trip when overloaded. Imagine our previous example; if the attached load to circuit #1 needs to draw 30 amps, and the circuit breaker feeding the load is rated only 20 amps, then the circuit breaker will trip. This circuit breaker trips because it senses there is more power than it can draw. This is a safety concern to protect the wiring of the circuit – the wire from the service panel to the outlet you are using to plug your load into. Imagine if you have a 20-amp circuit breaker in your service panel that feeds an outlet in your kitchen. The circuit breaker is sized to protect the wires that connect the service panel to this kitchen outlet; in our case, the wire is rated for 20 amps. Thus, this circuit breaker is protecting the wires, because if the wires heat up from too much current, too many amps – anything over 20 amps, then the wires can catch on fire. So remember, every circuit has a set limit on how much power it can draw for safety reasons. Every circuit is fed from its own dedicated circuit breaker. This makes it easy to isolate an individual circuit. 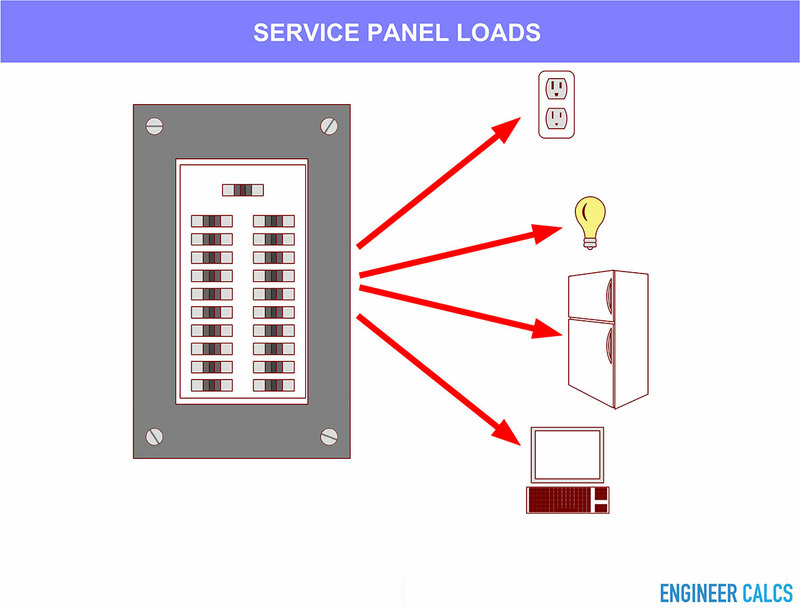 The service panel schedule below shows the connected loads to each fed circuit. The “CB” is representative of “Circuit Breaker”. Then, the “20/1” is in reference to a 20 amp single pole circuit breaker. The first load on circuit #1 is “Kitchen lights”. If we flip this circuit breaker to open, then the kitchen lights will no longer receive power, and the kitchen lights cannot be turned on. This makes it convenient if you need to work on the lights, or if the lights have been damaged and you need to cut the power to the lights for safety. Thus, if you do happen to connect a larger load to a circuit, more than the circuit can handle, and your circuit breaker trips, then simply unplug your load and reset your circuit breaker that’s inside of your service panel that feeds this circuit. You will see the circuit breaker switch has flipped sides, showing it has disconnected your circuit from the power source because of the overload. 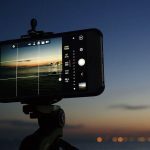 Thus, simply evaluate what you plugged into the outlet and lessen the load; and as previously noted, reset your circuit breaker by simply flipping the switch back again – the circuit will once again be connected. However, before you flip the circuit breaker to be active again, be sure it’s safe to do so, with both the load you have connected to the circuit, and with the surroundings indoors or outdoors to the circuit. How to avoid circuit breakers from tripping and fuses from blowing? Note: do not assume that the circuits that are all in one room – or area – are fed from the same protective device. For example, one room may be fed from two different protective devices, which is very common in the kitchen area. More times than not, you won’t ever need to bother with your service panel. But it’s always good to know where it is located, and to have all the protective devices inside be appropriately labeled in case of an emergency. Also, always leave space around your service panel. You don’t want to have to climb over objects to get to your service panel when you’re rushing to turn off power to a circuit due to an emergency. If your service panel door has scorch marks, this could indicate that there was an arc fault inside. An arc fault is a high-power discharge of electricity that was not intentional. Arc faults can cause fires or explosions. Don’t try to fix anything inside of the service panel on your own if you see this issue. Call a professional. If portions of the service panel are rusted, this may indicate a water leak somewhere. This could be very dangerous if not treated. Again, call a professional. Keep spare circuit breakers and fuses around your house for replacement. Always keep a flashlight next to your service panel. This way, if you have an outage, you can easily access and see inside of your service panel. Never insert metal objects like a screw driver into the panel to remove the dead front cover or the cover behind a protective device. You can potentially electrocute yourself. Always call a licensed electrician to work on your service panel or electrical problems that deal with your house. If you’re not comfortable doing something, no matter how simple, then don’t risk it. Your service panel is what gives life to your entire home, and it is not something to be afraid of. Simply become familiar with this panel, and have respect for the dangers it can bring. By following the safety tips that we provided, you will be able to safely diagnose and solve the simple electrical problems in your home. This will give you a leg up in the handyman work you do around your house, making you more self-sufficient. That is always a wonderful thing!